Need a night out? Up for a bit of banter and friendly competition? Come along to quiz night! First question will be at 7:30pm sharp. Price: $15 – includes a drink, plus the chance to win a prize! Teams of 6 - enter as a team or just purchase a ticket or two and we will put you in a team with some likeminded locals. Auctioneer Nicki Cruickshank of Tommys Real Estate will also be running a live auction on the night! 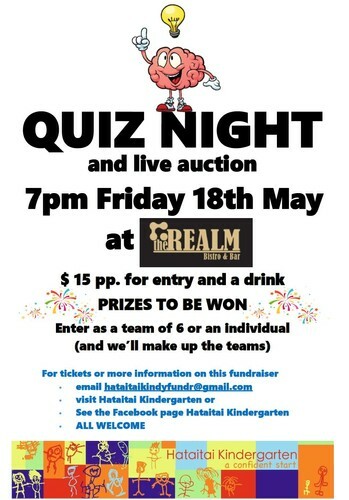 For tickets or more information email: hataitaikindyfundr@gmail.com or see the Facebook event on Hataitai Kindergartens page. Funds raised benefit Hataitai Kindergarten. All welcome!